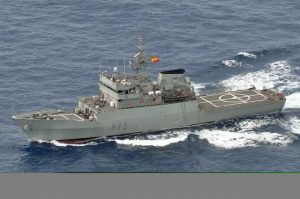 A Spanish Navy ship will sail into Sligo Bay later this month to honour the memories of Spanish sailors who lost their lives against the rugged Sligo coast four centuries earlier. VESSEL: The OPV Centinela will visit Sligo Bay later this month. Spanish Armada sank during Winter storms. The vessel will then be moored in the bay for the duration of the Celtic Fringe Festival, which runs from September 22-25. “The Parade of Sail will be an opportunity to remember all of the Spanish sailors who were part of the Armada, as we seek to continue to uncover one of the great untold stories of the history of this county,” said Eddie O’Gorman, Chairperson of the Celtic Fringe Festival. The Parade of Sail will form the culmination of the festival’s events which this year will see a series of events and lectures take place in Sligo town, in Grange and at Streedagh. Many of the events are free to the public and include guided walks along the De Cuellar Trail, the route taken by the Spanish Armada Captain Francisco de Cuellar, one of the few to escape the English after the Armada. Other highlights include nightly music events, a series of Armada lectures at the Glasshouse Hotel, and a Gala Reception at Sligo City Hall hosted by Mayor of Sligo Marie Casserly to honour the Spanish Deputy Head of Mission of the Spanish Embassy to Ireland, Mr. Rafael Soriano, Vice Admiral Fernando Zumalacárregui, Director of Naval History and Culture and Director of the Naval Museum; Lieutenant Commander Miguel Adolfo Romero Contreras and Officers of OPV Centinela.